Earlier this year when athenahealth Inc. was seeking a headquarters for a major expansion of its sales, implementation and customer service operation, the Watertown, Mass.-based company bypassed many traditional tech centers for Ponce City Market in Atlanta. The $4-billion company, which provides cloud-based electronic health records and practice management solutions for doctors and hospitals, decided to bring 500 new jobs to a region that is already well-known within the industry as the nation’s Healthcare Information Technology Capital. 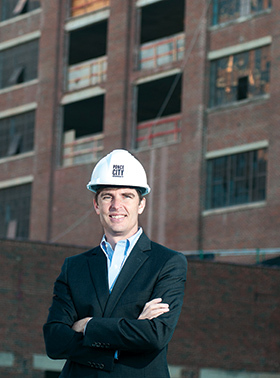 “We were considering other states and other cities, but decided that Atlanta is a great place to grow our business, and the Ponce City location really reflects our corporate culture more than some of the office [space] available in Atlanta,” says David Harvey, vice president of product strategy for athenahealth. The company is reported to be investing about $10 million to acquire 75,000 square feet in the downtown complex. Over the next five years, its footprint is expected to grow to 120,000 square feet as it expands what Harvey calls its customer facing operations. Ponce City Market is a $200-million mixed-use redevelopment of the huge former Sears distribution center. The iconic building appealed to athenahealth officials who saw it as being just the right type of cool space that appeals to the young, hip tech workers who favor urban walkable districts with plenty of access to shopping and entertainment. Anchored by academic institutions like Georgia Tech and big successful corporations like Alpharetta-based Mc-Kesson, the state has nurtured a wide variety of companies dedicated to providing the software and solutions that are transforming healthcare. These days the infrastructure of medicine and healthcare is very much a growth industry. Driven by demands from government and insurers for cheaper, more efficient care, doctors and hospitals have increasingly turned to electronic health records, mobile apps, Internet portals and video links to help deliver better care. This mammoth industry didn’t appear overnight. A good indication of how important healthcare IT is to Atlanta dates back to 1961. That year, a small group of industry and academic leaders formed the Healthcare Information and Management Systems Society (HIMSS). Since then it has become the industry’s leading trade organization with more than 35,000 members. This month the Fox Theatre will play host to the Health IT Leadership Summit. Nearly 300 representatives from the Georgia healthcare IT community are expected for the fourth edition of what has become a showcase of much that is new and different in the industry. Being the HIT capital is part ingenuity and part happy circumstance. When Walter Huff, Bruce Barrington and Richard Owens founded HBO and Co. back in 1974, few realized that it would grow into one of the most successful healthcare technology companies of its kind before being acquired by Mc-Kesson. Its first success, MEDPRO, enabled hospitals to track patients and manage reporting, scheduling, interdepartmental communications and data collection. “HBOC was clearly one of the top vendors in the industry, and they had an acquisition strategy that made them very large very fast,” says Wayne Myers, chief operating officer of Karna, a provider of health science, research and technology solutions and services to the government. At the same time, the pool of IT talent was also growing. New companies were being started, and the growth soon began to feed on itself. HIT leaders agree that Atlanta is a good place to build a company. WebMD founder Jeff Arnold decided the city was the place for Sharecare, a health and wellness social media platform that connects customers with top-ranking health and medical experts. Much of that talent has been educated at Georgia’s colleges and universities. Georgia Tech has turned out a long line of skilled technology innovators, and many of its graduates have gone on to found successful companies. Other institutions in the University System and private colleges as well have added to the pool of skilled workers, creating the kind of workforce these companies need. The state’s network of technical colleges provides training and education programs for many of the jobs in the healthcare IT sector. That doesn’t mean there is an overabundance of talent. Atlanta has approximately 20,000 technology companies and more than 260,000 technology jobs. Last year that second number grew by 16,000, and about 4,000 of those jobs went unfilled, according to the Technology Association of Georgia (TAG). Like every business, healthcare is about money. Atlanta has also been a leader in the technology needed for financial transactions. Every time a patient visits a doctor’s office or checks into a hospital, some kind of transaction takes place by credit card or insurance ID. Two thirds of all credit card swipes go through an Atlanta data center, according to Hartnett. The technologists who write the binary code for those very secure transactions are usually based here in Georgia, providing a ready source of talent. This is also the place for the technology that protects information as it travels around the Internet. Government regulations require that patient medical data be protected, and keeping it secure on the web requires a higher level of technology. Local companies such as IBM Internet Security Systems (founded by Georgia Tech alum Chris Klaus) and Dell SecureWorks are major players. “When you transfer that data from one place to another, from one physician to another or from a patient to a hospital, it has to be encrypted and HIPAA-compliant,” explains Hartnett. Security is also a critical concern for healthcare as consumers and physicians begin entering and accessing this kind of data via mobile devices such as smartphones and tablets. Here again, Atlanta is home to AirWatch, the industry’s top pro-vider of security for mobile. The area’s high concentration of fiber networks and data centers has made locating companies here an easy choice. “If you think about our history of having a robust telecom infrastructure and a premiere healthcare system, the two combined make it a natural fit for these IT companies,” says Carol Henderson, director of health sciences and advanced technologies global commerce at the Georgia Depart-ment of Economic Development. Since 2009, the U.S. Centers for Medicare & Medicaid Services (CMS) has dispensed more than $7.7 billion in reimbursement payments to more than 307,000 healthcare professionals and 4,000 hospitals to roll out electronic health records. American healthcare has long lagged behind Europe in switching from paper to electronic patient files. The so-called stimulus funding was designed to be the carrot, along with a stick that includes threats of lower reimbursements that would entice healthcare to get on board. The result has been a surge in electronic health record sales and a proliferation of companies selling them – at one point even Sam’s Club was offering one. Part of technology’s great appeal is the combination of better care and lower costs. To encourage people to take better care of themselves, healthcare has taken a cue from the retail industry with its own version of self-service. In thousands of retail stores across the country, SoloHealth has deployed kiosks with equipment that can identify risk factors related to obesity, hypertension and vision. The advanced machine conducts a diagnostic health risk assessment using an interactive questionnaire and measures blood pressure, body mass index and visual acuity. Based on this assessment, the consumer is directed to a local doctor for follow-up care. The popularity of these kiosks even enticed the U.S. Department of Health & Human Services (HHS) to partner with SoloHealth in a program to promote awareness of the new Health Insurance Marketplace created by the Affordable Care Act. One area where Atlanta has perhaps not fared as well as other cities is the lifeblood of tech companies – venture capital. Some observers say there simply aren’t that many venture capitalists in town, and much of the investing comes from outside the state. For the VC operations here, there are plenty of choices. At Venture Atlanta, an annual “beauty pageant” for tech firms seeking VC funding, fully a quarter of the presenters are now from the HIT sector – up from none three years ago, according to Hartnett. For many local leaders, the health of Georgia’s healthcare IT industry is vital to the health of the economy and its residents. Technology offers the promise of greater access to care even in rural areas that have few doctors or hospitals. Whether it’s telemedicine that brings big city doctors to a small town or retail store kiosks that alert patients to health threats, all reflect the promise of connecting people and providers in new ways.